Story structure and pacing have often been an issue for Verbinski, whose films often seem to drag in the third act. The Ring had several false endings before reaching its iconic climactic sequence of the ghost emerging from a TV set, none of The Pirates of the Caribbean films that he directed were less than two-and-a-half hours long, and The Lone Ranger also seemed to wear out its welcome with audiences. At the same time that these films struggle with an adequate story arc and repetitious content, they also shine when it comes to mood an atmosphere. A Cure for Wellness is a quintessential Verbinski film, with both the flaws and assets of the filmmaker magnified by this narrative. While the mystery at the center of the story is far from satisfying and can likely be guessed by the average genre fan, few films have captured the feeling of dread and paranoia as effectively, and the stylistic choices are endlessly fascinating. The mystery at the center of the film involves a remote spa in the Swiss Alps, where the CEO of a powerful company disappears to in search of an elusive cure. 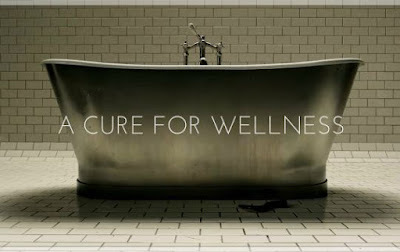 What the cure is and why the inhabitants of the spa need it, especially when some appeared healthier before arriving at the spa, is a question that a young executive named Lockhart (Dane DeHaan) intends to discover when the company sends him to spy. Why the other executives do not go themselves is a question that remains unanswered, as one of many possible gaps in logic found in the screenplay. But this is not necessarily a film about logic as much as mood, especially when the protagonist often appears to be losing his sanity. Horrific images haunt the narrative, though it is often difficult to tell which are real and which are imagined, making much of the film feel like a waking nightmare. The simple task of finding the CEO, Pembroke (Harry Groener), is overcomplicated by an uncooperative staff led by the head physician, Volmer (Jason Isaacs). The entire institution is comically unhelpful, with visiting hours that constantly seem to have just ended and a labyrinth of secret treatments that don’t ever seem to cure anybody, despite lengthy visits. Even Lockhart unwillingly becomes a patient after a freak car accident occurs during an attempt to leave. The more time that Lockhart spends at the hospital, the more strange activities are uncovered, and he simultaneously finds leaving to be a near impossible task. During his investigating, Lockhart comes across Hannah (Mia Goth), the youngest patient on the premises and one which seems to hold the key to the secrets of the cure being used on patients to treat their many unseen ailments. Sadly, the mood of the film takes precedence over characters, and it is difficult to relate or root for any of them. Hannah comes off as more of a ghost than a damsel in distress, more like a child in danger than a romantic interest for Lockhart. And Lockhart himself is just brash and immoral enough to remove any emotional impact from the torture he eventually endures. Even though I felt the film a solid 30-minutes too long, often unfocused, and lacking any real emotional resonance, there are images within A Cure for Wellness that are burned in my memory. There is so much done right within the filmmaking process that I found myself lamenting the weaknesses of the screenplay even more than I might have done with a less effective filmmaker at the helm. It is the assets of Verbinski’s filmmaking which make his shortcomings so disappointing. Steeped in dread concretely found in the unsettling images, if nothing else, this film has given me a newfound anxiety over dental work and the overly sanitized locations of medical facilities.